The Federal government has made no bones about it. With current Medicare policies, they simply are not taking the issue of bone health seriously. At least that is the position that Congress and Medicare has taken through the summer of 2008. Surprisingly, the public is by-and-large unaware of the situation. The result will likely be a degradation in the quality of life for many elderly, particularly women, as they experience hip fractures that could have been prevented in many cases with the support of adequate levels of Medicare DXA exam reimbursement. We are talking about Osteoporosis. It is a disease that causes a weakening of the bones. About 10 million Americans have the disease, with women at four times the risk. Another 34 million are at risk. For more information about Osteoporosis see the National Osteoporosis Foundation’s web site. Osteoporosis is known as the “silent disease”. It often shows no visible effects – until it is too late. The result is usually a fractured bone, the worst of which is usually the hip. A fractured hip in the elderly can be a life altering event. Almost one in four patients age fifty and older die within a year of a hip fracture. Many of those that survive require long term care. The good news is that drugs are available to prevent fractures. In the United States, a DXA exam is the most common test to measure bone strength – or bone density – and Medicare reimburses for the test. It is typically performed on an outpatient basis and usually takes less than thirty minutes. 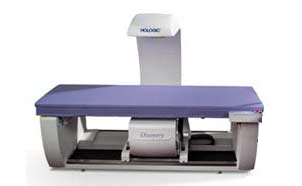 A DXA machine utilizes x-rays to determine bone density. Typically the hip and spine are measured and sometimes the arm. Figure 1 – A typical DXA machine. Figure 2 – A sample DXA hip scan. Starting in 2006, Congress and Medicare, in two separate and unrelated actions, began processes to reduce reimbursement to physicians for performing DXA tests. The cuts were gradual through 2010. By 2010, the reimbursement rates would be far below the cost to perform the tests. In 2006, Medicare paid approximately $139 for the test. By 2010 the rate was reduced to under $40. What does that mean for the elderly patient who is at risk. Most (about 70%) of these tests are performed in physician’s offices. Those physicians will be hit especially hard, because the DXA reimbursement cuts are a little more drastic for them. They will simply stop offering the tests. It will become more difficult to schedule an exam and patients will have to travel further. It is unclear how large institutions, such as hospitals, will react. Some may continue offering DXA testing. For these large health centers, the 2010 reimbursement rates are below their costs. The affects are just beginning to ripple through the industry. Some physicians have already stopped offering DXA tests. According to a study by the Lewin Group, 93% of physicians will stop offering at the 2010 reimbursement rates. Technologists, who perform the exams, have sought other positions or have been let go. Training of technologists has seen a significant decrease. The public seems to be largely unaware of the state of affairs regarding DXA testing. However, physicians and other industry groups have been fighting to save DXA testing in the U.S. There is legislation before Congress that could help. At this point, it is unclear whether DXA will remain a viable option in the U.S.
Cardea Technology is the maker of BoneStation, a software tool that assists physicians with the review of bone density exams.